We’re delighted to announce March 2019 UK tour dates for the exceptional Mile Twelve. This talented young bluegrass quintet has been on a swift rise in recent years since forming in Boston in 2014. 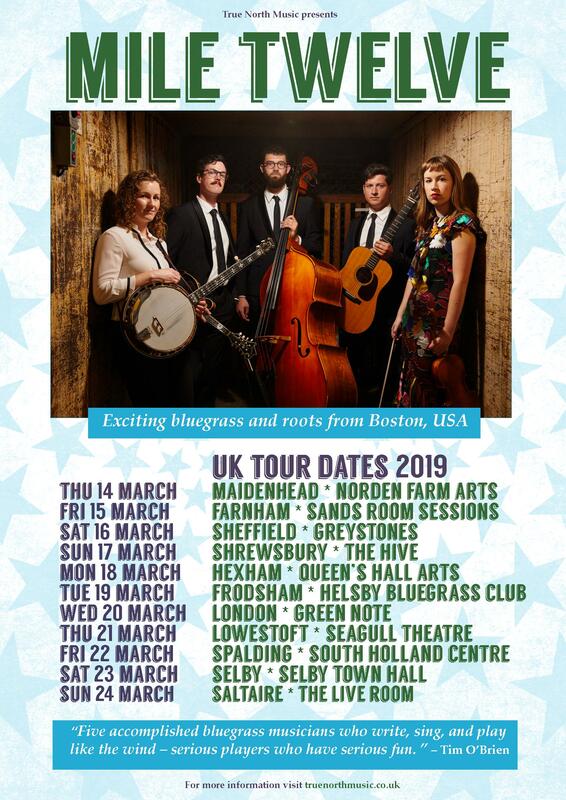 They’ve toured across the USA, Canada, Ireland, Japan, New Zealand and Australia, and won the 2017 Momentum Award at the IBMA (International Bluegrass Music Association) Awards. We’re delighted to be bringing them over for their debut UK tour! It was fantastic to finally meet the band and take in several of their showcase performances at IBMA in Raleigh, North Carolina this September, as well as their performance at the Rhythm & Roots festival in Bristol, Tennessee/Virginia. Check out the tour dates poster below, more details (and ticket links as they come in) can be found here.